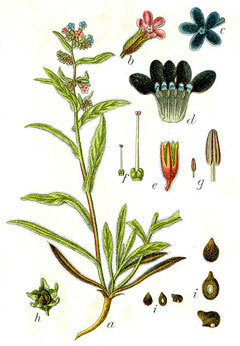 Anchusa Tinctoria (Ratanjot) - Alkanet Root Powder Alkanet root yields shades of grey, lavender, burgundies and purples in an alkaline dye bath. Use 75 - 100% WOF. 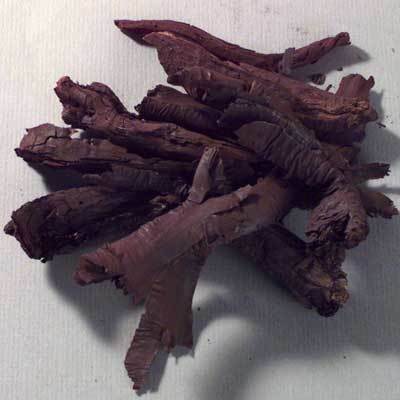 By extracting the dye first with alcohol and then adding it to pre-mordanted wool or silk in a dye bath it enhances the color. Use 15% WOF Alum for protien fibres and 8% Tannin and 15% Alum WOF for cellulose. Soak the Alkanet in Meths for several days then when it has developed a good strong colour, strain off the liquid and top it up with enough water to cover your fibre. 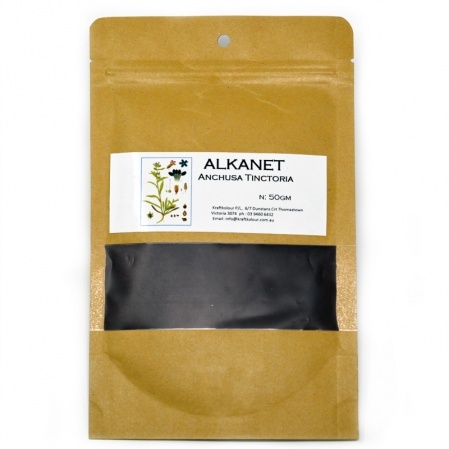 Alkanet can be dyed without using any mordants but gives patchy fastness. Also known as Dyers Bugloss.